Iguanos - Yes, kids, it's the amazing radio controlled Iguanos. This is a prototype shopped around through Mego's dealer catalogs. It is assumed to never have been produced. It is not known how many prototypes were made and whether any still exist. 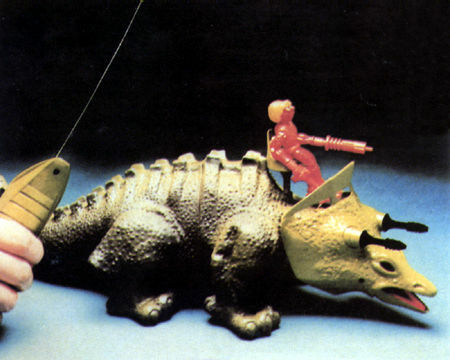 Iguanos was scheduled to be produced in the 5th series of Micronauts, along with Ampzilla, Sharkos and others.This is supposedly the toy that ended up being one of the 12" G.I. Joe's villains, although, in comparison, they don't really resemble each other all that much. Shown here under the studied tutelage of an orange-brained Membros.